BETA emerging technology arts and Fort Collins Museum of Discovery invites you to MORPHOS, an immersive audio-visual experience featuring the world premiere of new experimental immersive video art in the Otterbox Digital Dome and Gates Planetarium. MORPHOS will take the audience on a unique digital journey from generative graphics, a hypnotic experience, and live digital mash up as art becomes life in the immersive world. This unique 360° experience will have two shows Friday, October 16, 2015 at the Fort Collins’ OtterBox Digital Dome Theater and Sunday, October 18, 2015 at Denver’s Gates Planetarium. Doors open 6:30pm, show starts at 7pm and runs until 9:30pm. MORPHOS will highlight six international artists in residence’s new work and a reel of international artwork curated by Ethan Bach and Ben Gondrez. MORPHOS is a collaboration between BETA emerging technology arts and Fort Collins Museum of Discovery as a way to expand visual arts into the immersive dome. The OtterBox Digital Dome and Gates Planetarium are two of the first domes in the world to house software which allow artists to expand on the immersive experience through easy playback, interactivity, and audience generative art allowing artists to display generative art, use gaming engines, and VJ – a must see emerging immersive platform for digital artwork. Daniel Wiklund (http://www.hypnorama3D.com). Allergen by Hypnorama3D is a hypnotic journey through a transformational audio-visual color space, where the audience will explore the strange molecular world of allergic reactions. Solongo Su Tserenkhand (http://tssolongo.com/). Solongo’s work represents the fusion of Western and Eastern visual arts. Eastern art is represented by the symbol of Yin Yang and Western art is represented by mathematically computerized visual art. These two ideas are blended into each other to depict the merging of these two diverse cultures. Omolara Abode (https://instagram.com/yungvjomo/). #Omorado is a mash up of digital images performed as a live visuals as an abstract audio-visual exploration of blackness in the growing world of digital immersive art. Dan Bruce Arnold with Rich Clements (http://cargocollective.com/thiscountryside). A Murmuration of Light is an immersive piece of digital nature created as a site specific installation for the dome, a sculpture made with light. Oscar Sol (http://electronicperformers.in/index_en.html). 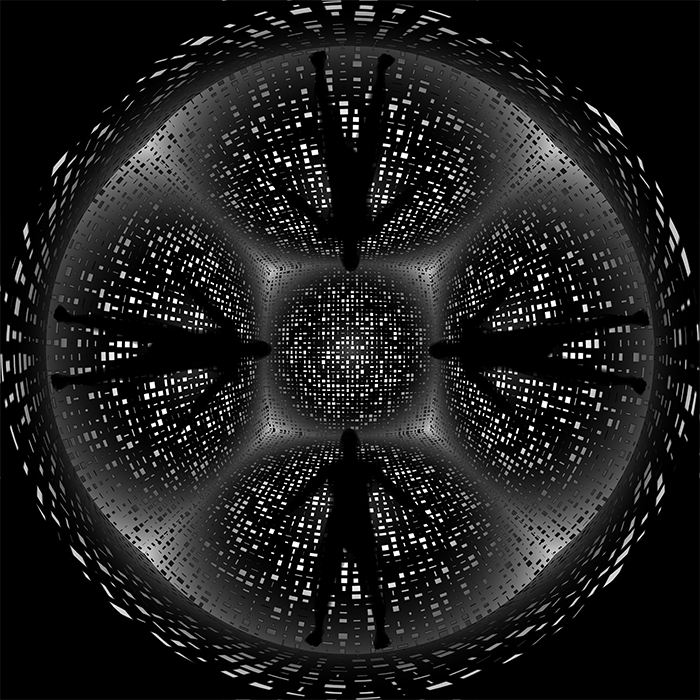 Quadrivium is a generative realtime performance with high levels of synchronicity with sound and experimenting with realtime manipulation of 3D models that flow within the complex geometries of the 360º immersive dome. MORPHOS will transport the audience from through a 360° immersive with live generative graphics, a hypnotic tunnel, to live video art mash up. The digital planetarium will never be the same. MORPHOS will take place in two shows; Friday, October 16, 2015 at the Fort Collins’ OtterBox Digital Dome and Sunday, October 18, 2015 at Denver’s Gates Planetarium. Doors open 6:30pm with a reception, show starts at 7pm and runs until 9:30pm. Gates Planetarium presents a view of the universe, using technology to tell science stories and help visitors experience the universe. The 125-seat planetarium features unidirectional, semi-reclining stadium seating, 16.4 surround-sound system featuring Ambisonic—a 3-D spatial sound system, and a perforated metal dome, 56 feet in diameter and tilted 25 degrees. The current Gates Planetarium replaces the older, dome-style planetarium. The planetarium will be fixed with a dome art server for this event.